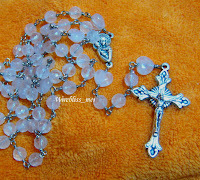 Ah well, another rose quartz rosary and this time its for Swee Lin, my niece. This picture here is however not Swee Lin. She is her younger sister, Mui Mui, turned 10 today. Swee Lin is too camera shy so Mui Mui posed with this rosary on her behalf. Both nieces are here for a short holiday with their mom and grandma. So, its a busy weekend for me. Managed to squeeze some time this morning and evening to get this rosary done. Another one on the way as well for the mom. The close up pic of the rosary is not so good. The color turned up too pale against the orange background. Must remind myself to change the background with lighter color for future photo taking. And for tonight's post, let me introduce you to my little boy - Henry, the younger one. He is two and very "ngiau"........LOL. Labels: Rosary | Cross , Wire Jewelry , z Jewels at Home Share it!